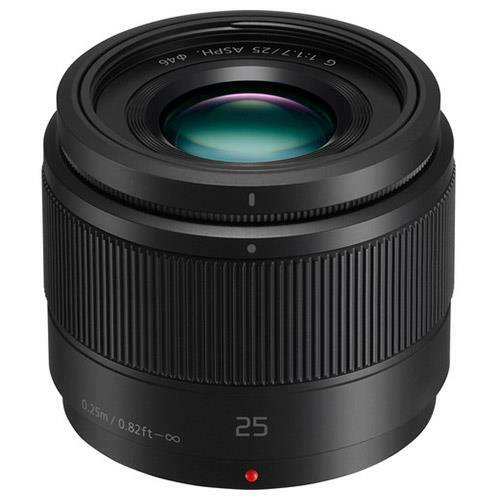 A fast, normal prime designed for Micro Four Thirds mirrorless cameras, the Lumix G 25mm f/1.7 ASPH Lens from Panasonic is a 50mm equivalent lens featuring a bright f/1.7 maximum aperture for enhanced low-light shooting and depth of field control. Two aspherical elements and one UHR (Ultra High Refractive Index) element give this lens edge-to-edge sharpness and uniformity of quality. The Panasonic Lens supports HD video for recording with your LUMIX Camera. With this lens there are no sudden jumps in exposure as it performs smooth aperture changes. Thanks to its silent design you get enhanced capture of the scene's audio. Supplied with Lens Cap, Lens Hood and Rear Lens Cap.